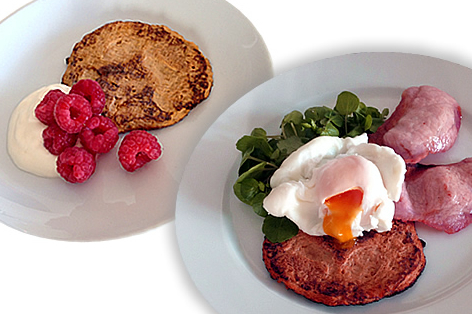 How do you make a pancake healthy? Easy, use this recipe! The sweetness of the potato means you won’t have to load them with syrupy naughtiness, and they go great with savoury flavours too. They keep well in the fridge and also freeze well. I freeze them in pairs in freezer bags and often throw them into my lunch box straight from the freezer to eat at lunchtime or on my journey home. Heat some oil in a frying pan, enough to generously cover the base when hot. I prefer coconut oil for this job as it withstands heat much better than olive oil. When the oil is hot, use a large tablespoon to spoon the mixture into the pan. Spread the mixture out so that it’s about half an inch thick. Allow the pancake to cook until slightly brown and then gently ease a fish slice underneath it to flip it over. Cook the other side until golden, remove from pan and work away with the rest of your mixture! Tip: You can also ‘savourize’ this basic pancake mix with herbs of your choice and use them as savoury snacks topped with anything from avocado slices, seed butter, rocket and goats cheese, etc. These versatile little pancakes are only limited by your imagination!